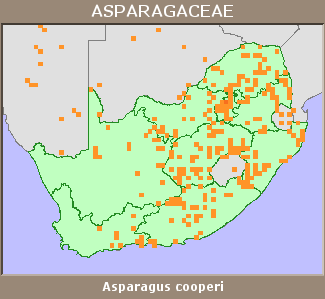 Asparagus africanus in sense of Jessop (in part), Asparagus burkei Baker, Asparagus rivalis Burch. ex Kies, Protasparagus cooperi (Baker) Oberm. Pooley, E. 2003. Mountain flowers: a field guide to the flora of the Drakensberg and Lesotho. Natal Flora Publications Trust, Durban.